Start 0.0 miles. 32°23’09”N, 112°52’21”W. Highway 85 milepost 40.8. Cabeza Prieta National Wildlife Refuge office and visitor center on west side of highway (1611 North Second Ave., aka Gila Bend Highway). The refuge is managed by US Fish and Wildlife Service. The office offers permits and information, and has a nature walk and small visitor center auditorium with displays and information. When built in 1980, the office was a model of energy efficiency: low sun-facing walls, special windows, efficient heating and cooling. The 30-acre parcel of open state-land next to the office was once part of the refuge and should be obtained for more visitor services, including a handicap-friendly walkway through a demonstration desert botanical garden. An expanded facility would greatly enhance the refuge’s ability to offer programs and exhibits for area schools, residents, and tourists. To the northwest is Childs Mountain, named for Ajo pioneers Thomas Childs, Jr. and Sr. 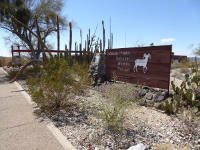 Periodically the refuge offers tours to the top of the mountain and its scenic vista. The Tohono O’odham called the mountain Kava? Mehidag, meaning “remains of a burnt shield,” as if a burnt or blackened war-shield is lying face up. Turn right (south) from the refuge parking lot onto Highway 85. Ajo offers your last services – gas, food, lodging – until Yuma, about 130 miles away. Always start with a full tank of gas and plenty of drinking water. Stay on the main road – Highway 85 – as the road curves eastward at the Shell station and then bends to the south as you near the Plaza. Mile 1.4. 32°22’21”N, 112°51’45”W. Plaza and Ajo’s only stop light. The iconic plaza is to your left, and the majestic old churches and Curley School are to the right. Ajo was founded in 1854 as a mining camp and boasted 7,000 residents in its heyday. Today the mine has closed but the community of about 3,500 people includes retirees, civil servants, and business workers. Curley School is an active, creative arts community. North of town at the end of Well Road are a country club, golf course, roping arena, shooting range, and several picnic grounds. 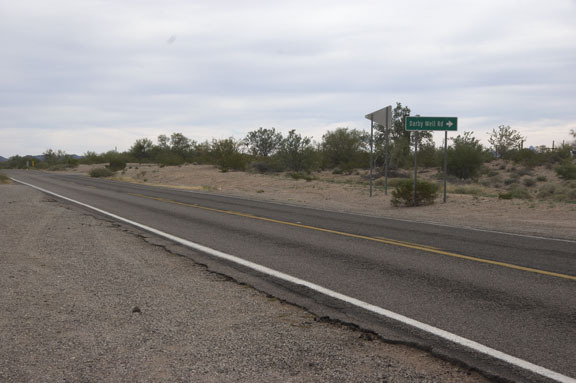 The unincorporated town is served by the Pima County Sheriff Department, the Ajo-Gibson Volunteer Fire Department, a utility company, the Ajo Copper News, and many businesses. The name “Ajo” generally includes former settlements of Gibson, Clarkston, Rowood, Mexican Town, Ajo Indian Village (Indian Town), and Old Ajo. Small amounts of copper from Ajo were used by Native Americans for pigment or ceremonies, and O'odham showed these minerals to an 1847 American expedition that included Tom Childs, Sr., who reported rediscovering ore here, and later his son Tom Jr. was instrumental in opening larger mining operations. Big-time open-pit copper mining began with the arrival of John C. Greenway in 1911, but ended in 1985. Copper production totaled 6.3 billion pounds from low-grade ore (average 0.8%). The Ajo mill and smelter, including its landmark smokestack, were dismantled in 1995-1996. Ajo’s name probably comes from the O’odham word for the desert onion (Allium macropetalum, a small, native onion with a garlic-like flavor), although some believe it is for the Ajo lily (Hesperocallis undulata) or the O'odham term o'ohon (or, au'auho) for the red oxides and green carbonates used as mineral dyes. A Hia-ced O’odham village southwest of town was called Moik Vavhia (soft well). The Hia-ced O’odham are western cousins of the Tohono O’odham (The Desert People) – if you came from Tucson you have just traveled through the Tohono O’odham Nation. The name “Hia-ced O’odham” means “The Sand People” because these people lived in the dry, sandy region of southwestern Arizona and northwestern Sonora, including the region along the Camino del Diablo. Mile 2.9. 32°21’58”N, 112°50’21”W. Continue on highway. A side road goes eastward to Burro Gap, aka Pipeline Road. A natural gas pipeline from Casa Grande to Ajo was laid along this route in 1936 to fuel the smelter and town. Mountains on the eastern horizon include the Pozo Redondo Mountains, Sikort Chuapo Mountains (also spelled Sikorttjuupo, meaning “round tank”), and the Sauceda Mountains, including the distinctive Coffee Pot Mountain. Mile 3.9. 32° 21’21.5”N, 112° 49’37.5”W. Key junction: Darby Well Road and Highway 85. Highway milepost 44.6. Turn right (southwest) onto unpaved Darby Well Road (aka Bates Well Road or Scenic Loop). The wide roadside is a good place to pause and reset your odometer. Paved Highway 85 continues to Why, Organ Pipe, and Lukeville, and Highway 86 goes to Sells and Tucson.